What is it about Charlie Brown that is so therapeutic? The same episodes have been playing on TV since before I was even born, yet whenever one of the Peanuts TV shows starts playing my heart skips a beat. Somehow I shrink back down to an eight year old and my mind empties of all my adult-world stress. Magically, I’m teleported back into my childhood where everything is pure, innocent and safe. Watching the Peanuts TV specials as an adult, I’m immediately taken by the fact that a whole world could exist of children only. In the Peanuts cartoons, adults are reduced to invisible, unintelligible background noise. Perhaps it was because I grew up watching the Peanuts cartoons, but even to this day I still see most adults in this way – joyless robots who try to enforce their authority with sporadic droning and irritating whining. Charlie, Lucy, Sally, Linus and the rest of the Peanuts gang have managed to develop their own sophisticated world of social rules and etiquette. Somehow this society of children exists successfully enough to teach us all the errors and ethical issues of our own cruel social behavior. With tact and subtlety, heavy philosophical issues such as religion and social acceptance are brought to light with fun and innocence. 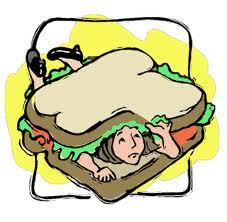 We see that these issues are not only found in the adult world – they can weigh just as heavily on the young. We can find our way through them with conscientiousness and honesty. Everything about the Peanuts kids world is amazing. Beyond their sense of right and wrong, they are always open to learning from each other. They eventually see the error in their ways and make changes for the better.Even though Charlie Brown will always be a Charlie Brown, he is an old soul. He will always be the heart of the Peanuts gang. The Peanuts kids have also incorporated the feelings and actions of animals into their own little world. As with any well-loved pet, a dog personified becomes a playmate with adventures all his own. We even able to see things from the point of view of animals – that within our society there are other smaller societies complete with their own social roles, etiquette and sense of right, wrong and fantasy. The music of The Peanuts cartoons is something I’ve always found just as magical as the stories themselves. The great pianist Vince Guaraldi has created a soundtrack that is uniquely 1960’s – uniting children’s stories with the easygoing coolness of West Coast Jazz. I am such a fan of Vince Guaraldi that I used to play his CD’s for my children when they were babies to help get them to sleep at night. I still listen to his music independently of the shows and have actually gone on to research more about the West Coast Jazz movement of the time. Now in my adulthood, it is comforting to know I can always recharge my ethical batteries by watching the same shows that taught me these lessons in my childhood. All too often, these lessons I so easily accepted in my younger years tend to be forgotten in my adult years of sporadic droning and irritating whining. Even listening to the music of Vince Guaraldi is enough to put me in a more peaceful mindset, leaving my brain open to wonder and magic and idealism. I’ve been watching The Peanuts with my kids today. I’m happy to say that my family enjoys these timeless stories over and over again as much as I do. Even on DVD, year after year, we still hang on to the edge of our seats to see what will happen when Linus runs for election as class president. And we always believe that somewhere out there The Great Pumpkin does exist – and hope that someday Linus will finally get the proof he needs to show The Great Pumpkin to the world. Thank you for this treasure you left to the world, Charles M. Schulz. Posted in Uncategorized and tagged cartoons, Charles M. Schulz, charlie brown, ethics, fall, Generation X, humor, life, Linus, middle age, midlife, musing, Peanuts, philosophy, snoopy, suburbia, The Great Pumpkin, The Peanuts, Vince Guaraldi, West Coast Jazz, writing. Bookmark the permalink. The most wonderful time of the year is here, indeed. Buying school supplies is second on my list only to toy shopping. When my kids received their lists of what pens, pencils and folders they’ll need this school year it sent me out on a hunt like I was on a reality TV game show. Tearing off to the local store, I stood elbow to elbow with other well-meaning moms as we dug through the picked over bins of folders to find the perfect ones that will encourage our children to do their school work, have a successful school year and become President of the United States one day. Or win a gold medal at the Olympics. Considering each of my kids needed only needed about four items, I was a bit disappointed that my school supply shopping frenzy only took about ten minutes at one store. I spent the entire summer revving up and practicing my store aisle drills in my hunt for obscure office supplies like reinforcements, poster board, tempera paint and rubber cement. Did I mention I love school supplies? For as long as I can remember, I’ve always loved the idea of buying fresh notebooks with blank pages that are ready for recording lessons and dreams and plans and doodles. I love the idea of picking out pens in any color of the rainbow. Should it be a flare tip or a ball point? Would spending extra money on a pen with a grip on the barrel really give me the ergodynamic confidence I need to write my way into literary history? Or, should I just save the extra fifty cents and be inspired by the starving artist spirit I channel in with my generic pack of plain pens in a bland color of ink? 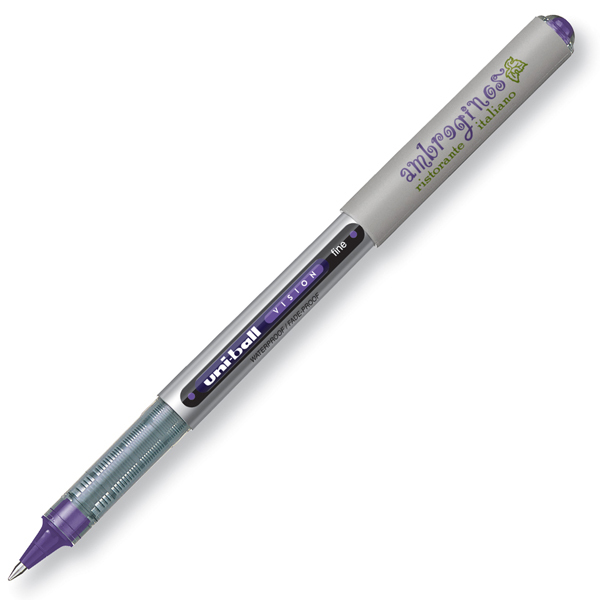 Since I no longer care about being “cool” I’m not embarrassed to admit that at one time I knew the model numbers and names of a spectrum of Uni-ball pens. I drooled over certain models and fancy pens. I once casually met a man in a bar in New York City who, in hindsight, must have thought I was interested in him personally. But all I kept looking at was his Mont Blanc pen. I’m serious. He insisted I take the pen, but then he would not stop calling me all the way from San Francisco. I think it was my intense love of said supplies that encouraged me to become a writer. How could I not want to write with that state of the art Uni-ball? Having a blank journal with heavy-stock paper only cries out for poetry, sketches, dreams and inspiration. Ok….not only have I digressed, but apparently the ‘Nerd’ sign over my head is on with all lights a blazing. Did you know that once you graduate from school the phrase “school supplies” becomes the phrase “office supplies?” I found this out first hand. My first job in the corporate world had me in a position where I was FREE TO ORDER ANY OFFICE SUPPLY I NEEDED! What? Yes! It’s true. I spent my lunch hours hunched over the office supply catalogue and dog-eared and post-it-ed many a page. Of course these items on my list were all things I NEEDED to do my job. I ordered a maroon stapler because I thought it was incredibly cool, a wire rack to display the rainbow-colored folders I’d also ordered. I picked out multi-colored folder labels and hanging files to match. And post its, and stickers to highlight important office business. And a lamp I needed so I could see the office supply catalogue better. Not only did my savvy office supply purchases make my gray cubicle “pop,” I believe my work performance improved at least 350% because of my wise purchases. I have vivid memories of the school supplies I had as a kid in the nineteen seventies and eighties. Of course, there were the usual suspects…folders, notebooks, pens and pencils. But some supplies can only be chalked up to products of another era. My first day of first grade I remember bringing in an oil cloth to cover my desk with. It was like a red greasy piece of fabric. What the heck was it? It smelled to high heaven and made me want to cry. The teacher who insisted every pupil bring one to class was about eighty years old. I can only assume that an oil cloth must have been a popular school supply when she was a youngster during the late eighteen hundreds. Whatever mess it was supposed to prevent I promised to not become involved with in the first place if I could keep that greasy red square out of my life. Another elementary school staple…paste in a jar. Paste in a jar? Was this an era before liquids were invented? All I’m going to say is that the texture is greasy and lumpy and it’s minty flavor doesn’t taste as good as it smells. In junior high Trapper Keepers were the happenist supply in the land. They were like binders that folded over and sealed with velcro. This was a bonus to keep papers intact incase an upper classmen decided to have fun at your expense and “flip your books.” Today this would be called a “bully” – and rightfully so. 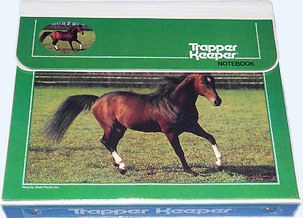 Trapper Keepers had cool stylings on them such as rainbows, unicorns, and even pictures of horses. 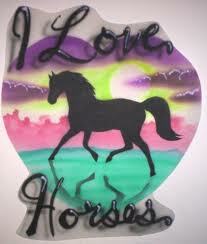 When I was in junior high I was obsessed with horses. I had myself convinced that I could keep one in the garage of my house in a suburban neighborhood. Hey, I guess that would have really put the “Neigh” in neighborhood, huh? Sorry. Anyway, during that school year we had to cover our books with book covers. We made them out of brown paper grocery bags. I personalized mine with stickers of horses. But, since I was in an unspoken competition with my best friend who also loved horses to prove who loved horses more, I wrote “I love horses” all over my book covers. I did this with every book cover for every book for every subject. In fact, had to open the books up to the cover page to actually see what subject they were for. This totally slowed things down at the locker during class change time, but it was the suffering I endured for my passion. My horse-obsession came to a halt quickly one day when my health class teacher, high on her own anti-drug lectures, told me that if she didn’t know me personally she’d think my writing “I love horses” really meant “I love heroin.” She then sternly let me know that “Horse” is slang for “Heroin.” I don’t think I ever completely recovered because here I am thirty years later still stunned by her bizarre assumption. Other school supplies I remember that are probably illegal by now…rubber cement, grease pencils, protractor, compass, T-square, and markers that smelled like fruit. Even as a kid I always thought it was a bad idea to encourage kids to sniff markers. It’s quite likely that there are liability issues in today’s world that prevent schools from having kids bring in any supplies that are/may be interpreted as being sharp, greasy or tasty. The school supplies I’ve had to buy for my kids over the years makes me feel like they are living in a bubble: folders, tissues, glue sticks, coffee filters. Yes, coffee filters. Soft and non-threatening, I suppose. But I don’t know how you will keep a cool image when an upper classmen tries to have some fun at your expense and your coffee filters end up gently and quietly floating everywhere. Posted in Uncategorized and tagged 1970's, 1980's, artist, bar, blogging, book covers, coffee filters, eightees, folders, gen-x, Generation X, humor, humour, life, mom, mont blanc, mont blanc pen, new york city, office supplies, Olympics, parent, parenting, president of the united states, random, san francisco, school supplies, seventies, stapler, staples, uni-ball, writer. Bookmark the permalink. Ugh…What does “Time for Timer!” even mean?!? If you were a child of the 1970’s this phrase is what jarred you from your zombie-like state during Saturday Morning cartoons. That’s right, cartoons were only on Saturday mornings. If you were lucky you might be able to also watch “Tom and Jerry” and/or “The Super Friends” for an hour after school. But I digress. And not everyone was so lucky, so I don’t want to boast here. Nothing is worse than stewed hard-feelings, especially among an online community of people you’ve never seen or met who enjoy reading your blog. But, again, I, regrettably, digress. Saturday Morning cartoons were a staple of not only my childhood, but the childhood of Generation X. I remember waking up at the crack of yawn to secure my spot in front of our black and white 13-inch television with tinfoil on the antenna, and tune in for a few hours of cartoon-centered kid heaven. I don’t think I’d move an inch and I’m sure my mouth was agape with shock as if I was watching a warped live-action reality from somewhere else in the galaxy. The cartoons were one hundred percent textbook pieces of 1970’s animation. Bad hairdos, bad fashion and bad color schemes all hustled their way into this art form. Art is an imitation of life, after all. And the musical soundtracks for these cartoons were time capsules as well. You can almost imagine the musicians: middle-aged, overweight men with polyester pants and white patent leather shoes, probably sipping on some sort of a drink called a “Rusty Side Car” while they played the groovinist notes their wind instruments could bleat. Typical cartoon music of the time: blaring trombones, sneaky xylophones, and numerous sound effects that remain unidentified to this day. Example: Scooby and shaggy startled by another alleged monster start running in place quickly for a few seconds before they finally were able to take off. Also: any music that was a transition between scenes in the Super Friends – eerily creepy, and yet the suspenseful mania it generated was without compare. But back to “Time for Timer!” The TV executives in 1970’s must have thought this brief exposure to animation, and it’s associated cereal commercial brainwashing, were too toxic in its pure form. To counteract this poison, Public Service Announcements were played to show kids what a good breakfast would be, or why they need to eat Wagon Wheels – a revolutionary snack idea of cheese and crackers. The little cartoon hero, named “Timer” was a nondescript blob in a top hat, cane and bow tie. He also had some limber gams. He would sing and tap dance his way across the screen as he instructed young minds to fill ice cube trays with juice and tooth picks, eat a bowl of ice with cauliflower on top, or even have a peanut butter sandwich for breakfast. This last tidbit was revolutionary and blasphemous in my house, as we were served breakfasts of plain oatmeal and orange juice with brewers yeast in it. Hey, it was the seventies, and my mom was just keepin’ it natural. Only in my later years did I realize this nondescript blob was really a stomach personified. A dancing stomach! And in this era we are in of childhood obesity, it is almost hard to believe they had to have PSA’s when I was a kid REMINDING kids to eat breakfast, or have an afterschool snack! So, now, as a parent, I’m thinking about the consequences of our 24/7 cartoon marathon cable channels, and 24/7 kid centered programming, and the many other reasons kids have today to sit and stare. I’m wondering if there is a connection. Maybe I should put my family on the Saturday Morning Cartoon Diet where once a week we sit and stare at the TV for two hours, and for the entire rest of the week we are so busy playing outside that we might forget to have our after school Wagon Wheels. Posted in Uncategorized and tagged 1970's, cartoon, childhood obesity, diet, Generation X, humor, humour, mom, nutrition, parenting, PSA, public service announcements, saturday morning cartoons, scooby doo, suburbia, super friends, television, time for timer, tom and jerry. Bookmark the permalink. In my quest to take my high tech skills up a notch, I thought I should try blogging a post with a photo. And what makes a better photo than an adorable kitten? If this all uploads ok, then it’s another check off my list of my mad blogging skills. Posted in Uncategorized and tagged blogging, Generation X, humor, midlife, mom, musings, suburbia, writing. Bookmark the permalink. I’ll never forget the feeling when I first heard my 1980’s teenage generation was labeled “Generation X” by the more genteel “Baby Boomer” generation. It was kind of like I’d disappointed my grandmother. And her entire gardening club. And every pre-existing generation before mine. “No one could be as perfect as them,” I sighed, “they are America’s darlings.” The “Baby Boomer vs. Generation X” rivalry eventually grew to proportions only comparable with the well-documented battles between Marcia Brady and Jan Brady. Although not commonly discussed, or known, I’m assuming the Baby Boomer vs. Generation-X’er sides remain stubbornly divided even to this day. ultimately end up going to hell in a hand basket. Well, THAT was a lot to live up to. But, then came the grunge movement, and we kind of proved them right for a few years there. Now, I don’t know if we’re still naming generations. Perhaps that was a 20th century fad. Like when Pepsi turned clear. I think the current crop of American teenagers can be called “Generation-i” – for reasons obvious to anyone that isn’t a Baby Boomer. Sorry…the rivalry still awkwardly pops up on occasion. Or, perhaps “Generation-z” because that would be a great way to “finish” the alphabet. There are almost too many great “Generation” names to think of. Maybe, just maybe, this means these modern teenagers are a group of individuals that shouldn’t be lumped together under one umbrella term? Sigh….I guess the world-changing, rebellious teenage Generation-X’er still lives on inside this aging body. Looks like I have no choice but put on “People are People” by Depeche Mode and call my local Baby Boomer Representative (aka my mother) to start making much needed Gen-X vs. Baby Boomer amends. *more posts on this topic later. many more. Posted in Uncategorized and tagged baby boomer, blogging, depeche mode, eighties, Generation X, humor, jan brady, marcia brady, midlife, mom, musing, suburbia. Bookmark the permalink.